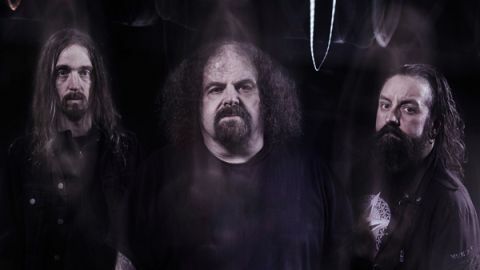 Malformed Earthborn, Meathook Seed, Blood From The Soul and now, Tronos: on paper, the latter may seem like the last in line of a long series of exercises for Shane Embury to master the art of industrial-tinged rock/metal. Yet Tronos is more the shining vision of long-time Napalm Death producer and Embury’s metal-brother-in-arms in Absolute Power, Russ Russell. There is a slew of prestigious guests – ex- Soilwork and Megadeth skinbasher Dirk Verbeuren, Snake from Voivod, Troy Sanders of Mastodon, Faith No More's Billy Gould and, more surprisingly, Erica Nockalls from The Wonder Stuff – whose contributions blend effortlessly into this big sci-fi and atmospheric slab of massive metal. It’s almost uplifting in places, like Strapping Young Lad on a joyful bender. Totally reinvented, even the cover of Sabbath’s underrated Johnny Blade seems to come straight from Venus. Celestial Mechanics is out on April 12 via Century Media and available to order here.